a little money, too, and built themselves a little hall for their meetings and entertainments and to house their modest lending library. But that is all a part of the past, as the Finnish farms of Isabella are also apt to be a part of the past. Previous mention has been made of Finnish settlement in the vicinity of Brimson, on the eastern edge of St. Louis County. Essentially a part of that settlement, but requiring consideration here because the boundary puts it in Lake County, is the settlement called Toimi. ter and had M. J. Beck as assistant under him. K. Huttunen was the first carrier, but he was succeeded by Vic Harju. Later postmasters have been William Ahola, Sulo Härkönen, and Victor Taipale. The Finns of Toimi participated in the Finnish organizations at Brimson, but they also had a few of their own. One of these, a temperance society, was started (1934) after the repeal of Prohibition; it was affiliated with the Minnesota Temperance League and was still active during World War II years. There was also a workers' society, with about 20 members, enough to sponsor dramatics as its main cultural activity. A local cooperative was established in 1932, the Toimi Cooperative Company, which joined the Cooperative Central that same year. About 30 miles northeast of Two Harbors, on the shores of Lake Superior, is the new, bustling community of Silver Bay. 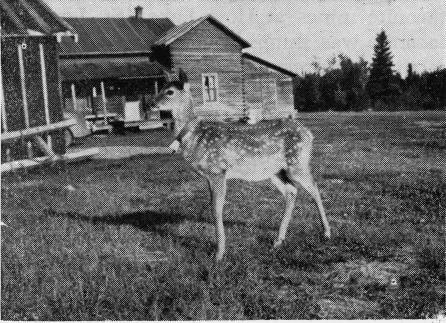 The Hilda Kotilainen homestead in Isabella.